​For an inexpensive product, this subwoofer provides a great deal of functionality, including a remote control for fine tuning. ​It uses a strong aluminum design, as opposed to the cheaper plastic shell that many units opt for. Mounting system includes quality Velcro and Nylon components. ​This is a sleek and attractive model. One of its main selling points is its size; you can literally install this subwoofer in very small, unobtrusive places. As far as 'price VS functionality' goes, you get a lot of value for money out of this unit. More expensive models offer even better audio and more features, but this delivers great bang for your buck. In this review, we look at the compact automotive subwoofer, the KICKER Hideaway. It’s an inexpensive, yet powerful unit, which is small enough to mount into the most unobtrusive places, and durable with an aluminum frame and strong ground-thumping audio output. Though it lacks an adapter and relies heavily on careful placement for optimal output, it’s still a very powerful unit. Read ahead to find out more about this subwoofer. The Hideaway is the first compact powered subwoofer to come from the KICKER brand, winning numerous awards for design and engineering at the International Consumer Electronics Show (CES). The product has been around since early 2011, with generally positive acclaim garnered from the automotive community. It’s the perfect unit for bringing more powerful bass output to a vehicle, while on a budget. What’s more, it’s ideal for small vehicles, where achieving strong bass output is often limited by the space available for the installation of sizable subwoofers. 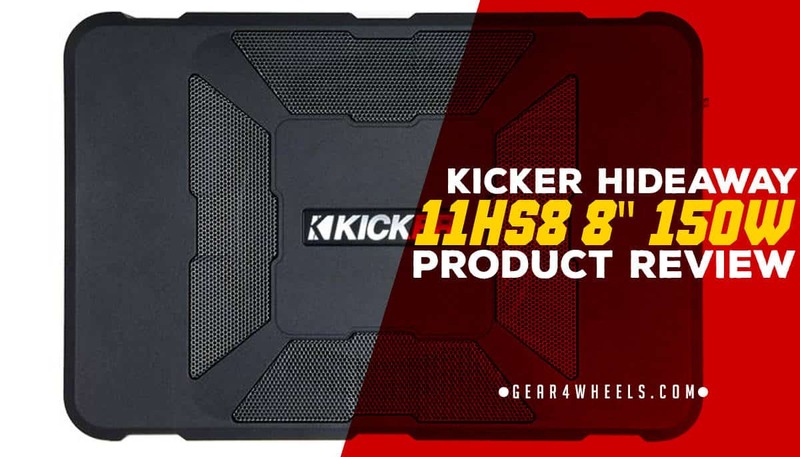 The Kicker Hideaway is a small unit with a considerable amount of power, but it is still limited by its own price tag. More expensive units are capable of producing a more pounding bass, but that said, they also typically tend to be larger, and thus lose the benefit of being able to be installed in such small spaces. Additionally, the Hideaway produces powerful ground-thumping bass that will be felt throughout the vehicle, primarily in the seats above it when installed. However, it’s the not the kind of unit that is going to shake the sidewalk as you drive by. In essence, this product is well-suited to the person who wants to improve the bass capabilities of their vehicle’s audio outputs, but who doesn’t want to spend a great deal of money in doing so. 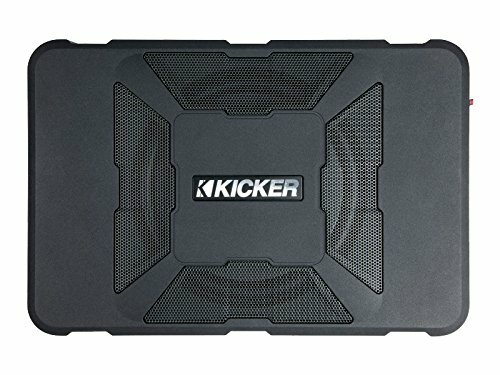 The KICKER Hideaway Compact Powered Subwoofer is capable of producing incredible low-frequency audio outputs from within a surprisingly small aluminum enclosure, setting the bar for plug-and-play bass audio quality. The Hideaway subwoofer's tiny footprint is just 3 inches in height and just 14-inches wide, making it perfect to slot into the smallest compartments within a vehicle. The enclosure contains an 8-inch subwoofer with a 150-watt amplifier, bringing car-shaking bass to any vehicle in which it is installed. Also included with the Hideaway is a quick-connect power cord, as well as straps made from nylon and Velcro, which help to securely fasten the unit within the vehicle. It comes packaged with a remote bass control, which can be used to bring fine-tuned adjustments to the bass output on the go. Also included is an adjustable low-pass crossover, a phase-cancelling flip switch, variable bass boost, and automatic power-on functionality. The subwoofer has a frequency response of 25-120 Hz, and dimensions are as follows: 14-1/4"W x 3-1/4"H x 9-3/8"D.
Though it’s not the most powerful subwoofer available for in-car use, it’s certainly one of the more capable compact units, which will be easy to fit into vehicular spaces that other, larger units wouldn’t stand a chance with. For the price tag, it’s also a feature-rich product, and certainly worth a recommendation.